"How dare you, you unrepentant piece of s**t!" Hell hath no fury like a woman scorned. The first trailer for Listen Up Philip director Alex Ross Perry's latest film, Queen of Earth, has arrived online via YouTube. Elisabeth Moss stars as a woman having a really tough time, so she visits her friend's cabin by a lake. There she encounters Katherine Waterston, Patrick Fugit and Kentucker Audley. It's essentially a funky horror-thriller about a woman gone crazy after a break-up, which you can get a sense of from this trailer for sure. Elisabeth Moss is excellent as always, she's a very talented actress, though I much prefer her in The One I Love over this film, which I caught in Berlin. It's wild. Have fun with this, let us know if you're into it. Catherine and Virginia are best friends. Last year, Virginia wasn't doing well, while it's Catherine who's struggling this year. Virginia's parents own a lakeside cabin, the perfect place for a week of mutual wound licking. Sun pours in through the windows, framing the cool green of the trees outside. But this isn't the refuge it seems and it's not just the music that awakens the menace in the images. The ripples across the lake and the wan sunlight offer little comfort, to say nothing of the picture of a skull lying forgotten in a cupboard. 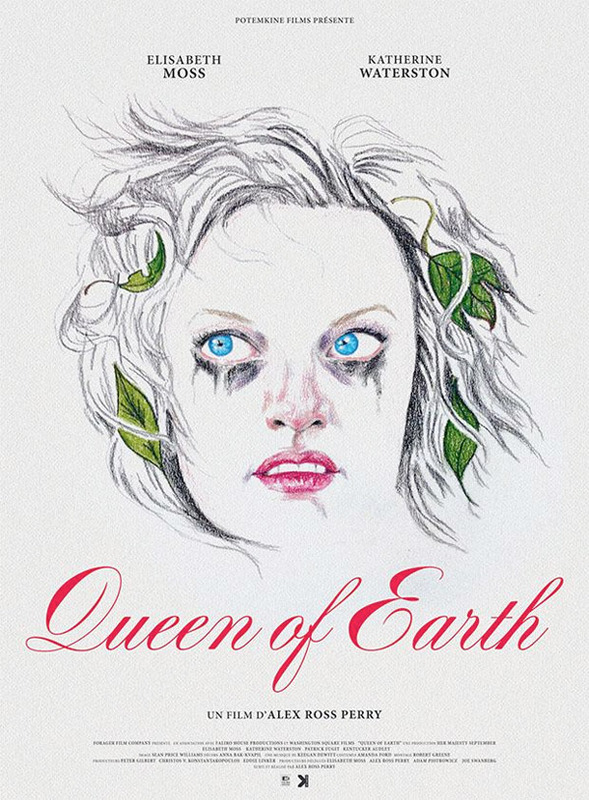 Queen of Earth is written and directed by filmmaker Alex Ross Perry, of Listen Up Philip, The Color Wheel and Impolex previously. The film first premiered at the Berlin Film Festival and also played at BAMcinemaFest. Queen of Earth arrives in select theaters starting August 28th next month. Can't wait. Had a Rosmary's Baby kind of slow burn, creepy vibe.